I am currently working on a pretty unique piece, at least I like to think so! It is a sword that is based around the season of summer, of an aged warrior who prefers not to fight, but can if needed. The time period I am shooting for is late migration, and I am not sticking purely historical, but inspired by. Here is a shot to take a peak at the pattern I achieved, 8 bars in the core with a 1020 layer edge billet. I've been following this one on Facebook. I must say, I found the Serpent sword more striking at first, but these close ups of the Summer sword really show the subtle beauty of the blade. Thanks! Pattern welding is one of those things that no matter how you photograph, it is always better and comes alive in person. One of those hands on experiences! These are looking just awesome! I do have one question...why no fullers? I know unfullered swords are common in the time period you're exploring but it's interesting that neither of them have fullers. Was it to show the patterns better? I'm also really excited to see htese all hilted up and ready. I assume you'll be using sandwich style hilt components and the like? I am currently gathering materials for the hilts, so progress is being made, just slowly, but also with intent The summer sword is up first. Hey Tim! I decided to go with no fullers since I am working a bit earlier. My understanding is that most of the Migration era swords were unfullered with a simple lenticular cross section so I decided I would give it a try and see how it differs without the fuller, and also get to play with some earlier hilts because I am really itching to try some cloisonné and these would be the perfect setup for those. As I am working earlier I am also starting to drop using modern alloy steel in favor of wrought, blister steel, and bloom steel so I think that is going to make a big difference with the kinds of bevels, thicknesses, and general cross section that I will be able to use. I will admit that grinding the Summer Sword was nerve recking enough and I kept checking the pattern to make sure I wasn't getting too close to grinding through a side, and the thought of adding a fuller in the mix is enough to keep me up at night. Down the line of course, but I think it's better to start simple and go one step at a time. Yes, I will be using a sandwich construction with Bronze and Silver stacked on either side of Red Spalted Maple with some inset garnets. Bronze collars with undecided decorative elements, and antler segments for the grip with iron spacers that have a line of gold inlayed. 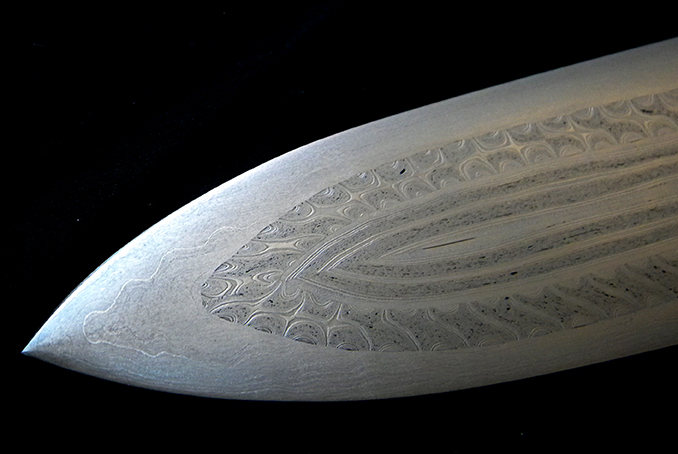 I am thinking about some kind of inlay or carving on the grip but the perfect solution hasn't manifested yet. I don't want to get too much into the pommel, but if I can source the materials I need I think it will be pretty amazing. Did I mention there is going to be a scabbard as well? I've also been following this one on Facebook, and I've got to say, this is the best picture I've seen of it yet! Absolutely beautiful! It sounds like it's gonna be a real signature piece and I can't wait to see it. I've always loved these migration era spathas with the sandwiched hilts. I know what a great smith you are so I'm sure this will be just amazing when it is done. GREAT WORK!!! I feel I have been remiss in not posting sooner to your most recent projects Michael. I was trying to find the right way to express how I feel about them. Unbelievable how nice the blades look comes to mind. Pure awesome is another. Glad to see you are not only still hammering away but raising the bar as you do so! Keep up the great work and I am looking forward to seeing this and the other two projects completed.